Cloudy Bay may have put a certain white wine and a region on the map but Australian expertise started the trend. Despite being shunned by wine buffs and recalcitrant writers such as myself, sauvignon blanc remains the world’s most popular white grape variety and has been for more than a decade, dismissing any notion it is a passing trend. While there is no sign of sauvignon blanc’s prevalence waning, overconfident producers should not be complacent. As witnessed in the past, entrenched styles and fashionable varieties can easily become passe. Trends aside, it is unquestionable that sauvignon blanc’s global proliferation can be largely attributed to one wine, Cloudy Bay, which put the variety and the Marlborough region on the viticultural map. Conceived in 1985 by David Hohnen, an Australian and founder of Cape Mentelle vineyard in Margaret River, Western Australia, the Cloudy Bay phenomenon had consumers following like sheep, no pun intended. It also polarized the term “cult wine,” having nothing to do with exclusivity or intellect; to the contrary, its magnetism was based on being the consummate social lubricant acceptable and approachable in price and style to all. Cloudy Bay is now owned by Louis Vuitton, coming under the umbrella of the Champagne house Veuve Clicquot. Rather ironic that New Zealand’s pride and source of vinous egotism was invented by an Australian and now owned by the French. Before you start accusing me of Kiwi bashing, I am a New Zealander and have lost none of my patriotism for the country’s wines. If Marlborough were in France, rhetoric would be fixated on terroir (the total growing environment from soil to temperature). In fairness, this region is a classic example of a grape variety finding utopia. Its southern coastal extremity ensures cooling breezes coupled with an abundance of long sunny autumn days, in fact one of the sunniest spots in New Zealand. Perhaps the conditions are almost too ideal, facilitating over-cropping and a dependence on mechanization. My concern, though, is that Marlborough is in danger of becoming a veritable sauvignon blanc factory, with more than 70 percent of New Zealand’s total wine exports being sauvignon blanc, the bulk of it coming from Marlborough. There is also a propensity with the Marlborough style to leave relatively high residual sugars in the finished wine, with six to eight grams per liter not uncommon. The key issue with ripeness is to achieve a level that avoids the unappealing asparagus, green capsicum and overt-herbaceous characters of unripe sauvignon blanc, at the same time not sacrificing vital natural acidity, which diminishes as the sugars increase. However, I feel the Marlborough grape growers are pushing the envelope with tropical fruit-bomb over-ripeness, which I liken to the syrupy juice in canned mixed fruit salad (requiring the addition of commercial tartaric acid to counterbalance), leaving your mouth gluey, and the wine displaying a flabbiness that has you struggling to get through the first glass, quelling any anticipation of another. As pointed out in my last article about reporting on an international sauvignon blanc challenge in Vienna, New Zealand was afforded 10 wines out of a total 50, with Australia a paltry two. While Australia may not have the white wine export status of New Zealand, shackled by its image of blistering sunny weather and bruising reds, this is hardly a fair sip of Aussie sauvignon. Adding insult to injury, the Australian producer with a real chance of victory and synonymous with sauvignon blanc, Shaw and Smith, was not even included in the tasting. 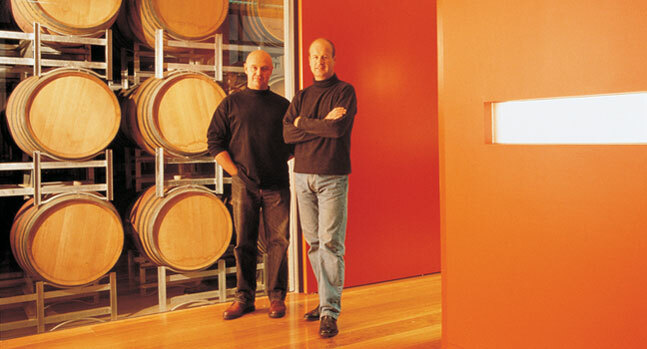 Co-proprietors Martin Shaw and Michael Hill-Smith (MW) may espouse that their M3 Single Vineyard Chardonnay is the flagship in the range, indeed a sophisticated and highly polished wine, setting the pace in contemporary Australian chardonnay. However, they have hit the nail right on the head with sauvignon blanc in terms of style and drinkabilty. Altitude is tantamount to cool- climate viticulture, the vineyards of the Adelaide Hills and Mount Lofty Ranges rising 400 to 600 meters above sea level. This is where Shaw and Smith’s fruit source, home vineyards and winery are situated, decisively the stronghold of Australian sauvignon blanc. The ripening season is long here, with radiant autumn days bringing the grapes to ideal ripeness, tempered by ultra-cool evenings, almost snap-freezing in the flavors and maintaining the pivotal naturally high acidities. I recently enjoyed a bottle of 2005 Shaw and Smith Sauvignon Blanc (HK$205) over dinner with my wife, which disappeared far too rapidly, leaving our mouths watering with zingy, tangy citrus, beckoning for more. It was perfumed with passionfruit and apricots, zesty with kiwi fruit and citrus notes, with shale-like minerality. It was expansive in the mouth with fresh fig and guavas flavors, a background of passionfruit underscored by vibrant citrus and grapefruit tanginess. It’s a tightly bound wine with racy acidity (an impressive 7 grams per litre) and crispness throughout, with an indelible lemon-edged, bone-dry finish; in fact less than 3 grams residual sugar per litre, and that’s as dry as Taranaki on a Sunday. My lambasting of the Marlborough style should not be interpreted as sour grapes, I have seen much more severe words from English press of late. Rather, I am patriotically concerned that their long-standing success with sauvignon blanc is blinding them from a growing trend towards lighter, drier styles. In my opinion, Shaw and Smith have perfected it stylistically, although it might not go down too well across the Tasman that Australia is still dictating the fortune of sauvignon blanc.